This is a big match! Each team comprises 20 firers, steered by a Main Coach and 5 Target Coaches, and backed up by 5 Reserves; add on the Captain and Adjutant, and that’s 33 team members! Match conditions are 1 sighter and 7 shots to count, at each of 300/500/600 yards. 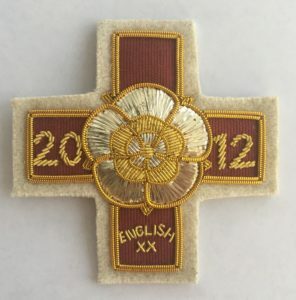 Restricted to the four Home Countries, the English Twenty Club voluntarily level the playing field in the ‘National’ by selecting 5 new caps every year for their team, as well as a further 5 who have not shot more than once, previously. The Reserves also have to be new to England selection. This policy has resulted in exciting matches in recent years. Instead of weight-of-numbers enabling England to win comfortably, year after year, Scotland have won twice since 2010, while Northern Ireland tasted victory in 2002, and Wales likewise in 2016 – by just one point! 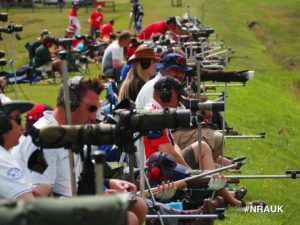 While this is all very well for British shooting, “England expects” in the future, when it comes to winning the National for our home country! Competed for since 1864 – originally at Wimbledon, but at Bisley since 1890 (except when an Irish or Scottish win has permitted the victors to hold the following year’s match in their own countries) – the National is a highlight of the Imperial Meeting in July. Every aspiring target rifle shooter strives for selection, and can be rightly proud when chosen for the first time. This will be as a result of good shooting in individual competitions, leading on to successful performances in Club and County matches. In turn, these are likely to result in selection for English Twenty Club representative teams such as those competing in the ‘RAF’, UK Armed Forces, and ‘Welsh’ invitation matches held at Bisley in May/July/August respectively, or possibly the Lawrence Trophy match held during the Scottish Open Meeting at Blair Atholl in June. 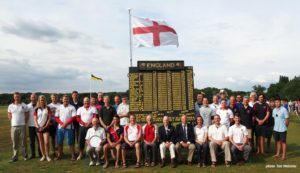 It should be mentioned here that all those selected for the England National team not only have to be members of the English Twenty Club, but should also have entered the Club Championship, held concurrently with the short-range competitions in the Grand Aggregate of the Imperial Meeting. This is to ensure that those selected for England are also prepared to be supportive of the England Club. 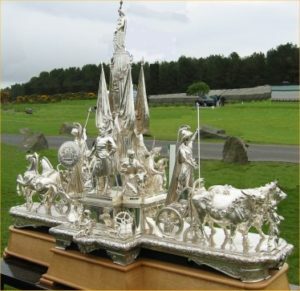 The National trophy itself is spectacular, worth thousands of pounds, and requiring at least 4 people to lift it. In past years, when won by England, it would be taken to the Mansion House in London and formally presented to the Team Captain by the Lord Mayor of London. These days however, because of its value (or possibly a shortage of strong team members? ), it is kept permanently in the NRA Museum at Bisley; well worth going in to have a look! The year 2017 saw the introduction of the ‘England Lions’ training squad initiative. This is designed specifically for those who have not been capped or have only been capped once for England and show potential to make regular England appearances in the future. Those members who believe that they are worthy of consideration may apply to join the squad, with the intention of further developing their skills under the tutelage of some of England’s top shooters and coaches. Selection for the Lions squad does not guarantee future selection for the National or other England teams but will hopefully provide the squad members with the confidence, skills and exposure to top level shooting that will give them a stronger chance of being selected in the future. Understandably, numbers each year are limited more details can be found at the links below. There’s no doubt that competition for ‘Big Match’ selection in the future is going to get even stronger!